Internet and computers made our life easier but it also made it easier for hackers to loot your account online. They use a variety of methods to do this like by spreading spywares, hacking you PC, via Brut-force attack to reveal account passwords etc. In addition to using a layered computer security system, there is no alternative of making a strong and secure password. Only these can make the life of hackers tougher. Earlier I wrote about Password Generator which can create passwords based on the options you choose. PC Tools Password Generator is a nice online service that does similar thing. It is available both as a normal and a SSL secured version. 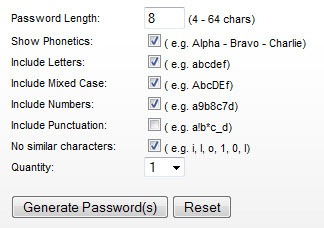 This service can create passwords 4 to 64 characters in length. You can create up to 50 passwords at the same time. 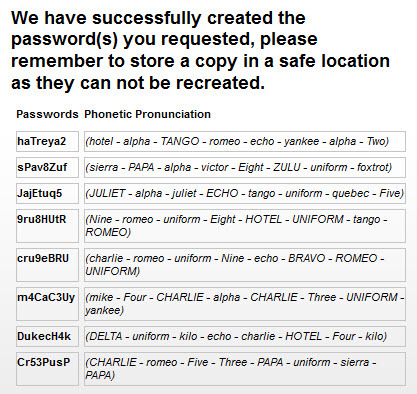 This service has an exciting “Show Phonetics” feature, that will help you to remember passwords. I use this service more often and will thus recommend it. Do use the SSL secured version for added security of the created passwords. This entry was posted in Free, Online Service, Security Related, Tips.